A Destiny 2 Fireteam isn't exactly the easiest thing to put together, especially if you don't have anyone on your friends list who happens to be playing the game. In this Destiny 2 Fireteam Finder guide, we'll be walking you through how to put together your very own squad, no matter which platform you're playing on. For anything else at all on Destiny 2, be sure to head over to our Destiny 2 guides walkthrough hub, where you can find all the information you need on every Strike in the game, as well as a walkthrough of every Crucible mode and map that you can play. You'll need your own Fireteam to take down many of the endgame activities in Destiny 2, and you'll need to get together with three additional players for the Trials of the Nine mode in the Crucible, or five other players to form a Fireteam of six for the Leviathan Raid. To assemble a Fireteam through online methods, you'll need to head over to the Fireteam Finder section of the official Bungie website, where you'll find people posting on the forums in an attempt to recruit players into their Fireteam. This may be for a specific activity, such as the Nightfall Strike, or it could simply be for undertaking any endgame activity in Destiny 2. You'll need a full Fireteam of 6 to take on the Leviathan Raid. Down the left hand side of the screen, you'll see the PS4 and Xbox One options, and you should select the one that applies to you. Just below this, you'll then see a list of options including 'Up For Anything', 'Raid', 'Nightfall', and more. Within these sections, you'll find players recruiting for a Fireteam to take on these specific activities, and once you select an option, you'll be taken to this area of the Fireteam Finder. 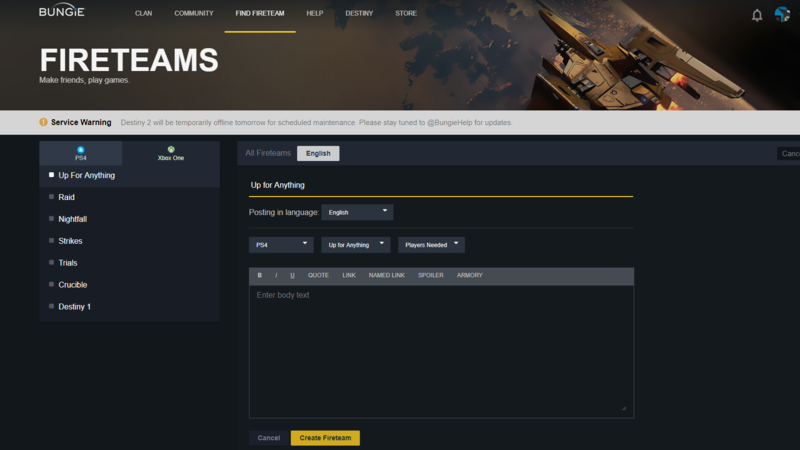 Once you're in the desired section of the forums, you'll find yourself faced with a long list of players recruiting for their Fireteam, using titles like 'Flawless Trials Run', or 'Raid Run Mic Required'. Pay attention to these headers, as you don't want to enter a Fireteam that requires you to use a mic if you don't have your own mic to hand. Select a Fireteam that has a spot open, and then click 'join Fireteam' to reserve your spot in the list. Once this Fireteam is at full capacity for the chosen activity, for example four players for Trials of the Nine and 6 for the Leviathan Raid, the player who created the Fireteam will then be prompted to accept the Fireteam through the Destiny 2 companion app (which you should absolutely download, by the way). Now, the Fireteam leader will add you, through either PSN or Xbox Live, and you'll have to accept their friend request, before joining their in-game Fireteam. Now, you're ready to face the many endgame challenges of Destiny 2, all with a complete Fireteam at your side. Finding a Fireteam through the Bungie website can be a slog, particularly if the Fireteam Leader isn't paying attention to the fact that their Fireteam has been filled. So, why not skip this process and create your own Fireteam in the Fireteam Finder section of the Bungie website? To start this off, all you need to do is go back to the Fireteam Finder section of the Bungie website, and click the yellow 'Create Fireteam' button on the right of the screen. This will bring you to the screen just below, where you'll be presented with a list of options in order to better advertise your Fireteam to the world. The title of your Fireteam is where you really need to communicate the activity you want to undertake in Destiny 2, be it the Nightfall Strike, Leviathan Raid, Trials of the Nine, or any other endgame activities. Try to write something simple and catchy, but also informative. 'Need 5 for Raid', or 'Experienced Trials Players Wanted', will probably go down well, for example. Once you're done with the title of your Fireteam Finder advertisement, you need to fill out the body of text. This is where you can get more specific, for example specifying the need to communicate over a mic, or if you need veteran players over a certain Power level. You should also add your PSN or Xbox Live ID here, so your Fireteam members know how to add you quickly. A competitive Trials of the Nine match, made possible by the Fireteam Finder. This is all you need to do for the Fireteam Finder if you want to set up your very own Fireteam, as you now just need to wait for your Fireteam to fill with the desired amount of players.